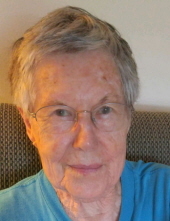 Genevieve Allen Boswell, age 94, went home to be with her Lord and Savior on Sunday, February 3, 2019 at her residence surrounded by loving family and friends. Genevieve was born on December 15, 1924 in Carlisle County, KY to the late William Terrell and Ruth Todd Allen. She worked as an LPN in Jackson, TN prior to becoming a devoted wife and mother. Her greatest joys were reading her Bible, prayer and intercession for others and spending time with her great-grandchildren. She attended From Fathers Heart to Yours Church. She is survived by her daughter, Renee Boswell, of Paducah; son, Timothy Allen Boswell, wife Linda, of Mililani, HI; step-son, David Boswell, wife Katie, of Smithland; sister, Jeanette Frey, of Indianapolis, IN; four grandchildren, Breck Boswell, husband Michel Leblanch, Johana McGill, Gabriel McGill and Andrew McGill; two step-grandchildren, Clark O’Brien, wife Jordan, and Lee O’Brien, wife Kaylee; eight great-grandchildren, Isaac & Eleanor Leblanch, Cinch, Tuff & Stetson O’Brien, and Hunter, Blake & Jolee O’Brien; and several loving nieces and nephews. She was preceded in death by her parents; her husband, James Isaac Boswell; step-daughter, Dianne Boswell O’Brien; four brothers, Billie Todd Allen, Edward Allen, Milton Allen and Elmo Allen. Funeral services will be held on Saturday, February 9, 2019 at 1:00 p.m. at Milner & Orr Funeral Home of Bardwell with Rev Ralph Hale officiating. Burial will follow at Old Bardwell Cemetery. Visitation will begin at 11:00 a.m. until time of service at the funeral home. Expressions of sympathy may be made to The Gideons International, Carlisle- West Graves Camp, P.O. Box 608, Cunningham, KY 42035 or From Fathers Heart to Yours Ministry, 571 St Rt 1935, Bardwell, KY 42023. You may leave a message for the family or light a candle at www.milnerandorr.com. To send flowers or a remembrance gift to the family of Genevieve Allen Boswell, please visit our Tribute Store. "Email Address" would like to share the life celebration of Genevieve Allen Boswell. Click on the "link" to go to share a favorite memory or leave a condolence message for the family.